We offer an air conditioning maintenance contract with every cooling system we install. This is a service plan that combines regular inspections with air conditioning repair discounts and a labor warranty. In addition to the cooling service calls, in Denver and the front range, including Boulder and Longmont, for air conditioning repair services when something goes wrong with your air conditioning system, we also offer our Comfort Club – an air conditioning maintenance service agreement. As as a member of the club, we will come out every year and perform a clean-and-tune heating and air conditioning service and touch base with our customers to see how well our air conditioning installation is serving you. Lower quality air conditioning companies don’t offer this type of air conditioning maintenance agreements, because rather than providing air conditioning service, they are simply providing a piece of equipment. As Northern Colorado’s premier central air conditioning contractor company Ameri-Mech is committed to air conditioner servicing in Boulder Co, Longmont and Denver for the life of your air conditioning equipment. Call us at 303-975-6090 to learn more about our heating and air conditioning service agreement. We would be happy to go over the benefits with you. 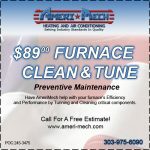 This service is only available to our existing customers and for new or replacement air conditioning installations by Ameri-Mech Heating and Air Conditioning of Longmont.